Get Regular Updates Through ‘Profitable Tanker’ E-News. Ambient-Cure Tank Coating for Product/Parcel Tankers. MarineLINE® Versatility Safely Carries the Full IMO Range. MarineLINE® After Sales Service for OBIs & Repairs. Presenting New Eco-Friendly MarineLINE® Cargo Tank Coating. MarineLINE® Serves Both Chemical and Product Tankers. MarineLINE® Cleans Easily for Operational Efficiency. Contact MarineLINE® for all your marine cargo tank coatings in China. MarineLINE® 784, the tank coating to carry CPP products and switch to Methanol. Specify MarineLINE® for carrying CPPs, PFADs, Methanol, and Bio-Fuels. MarineLINE® handles many types of aggressive chemical cargoes and liquids. Carry Methanol Then Switch to Other CPP Products Without Restrictions. 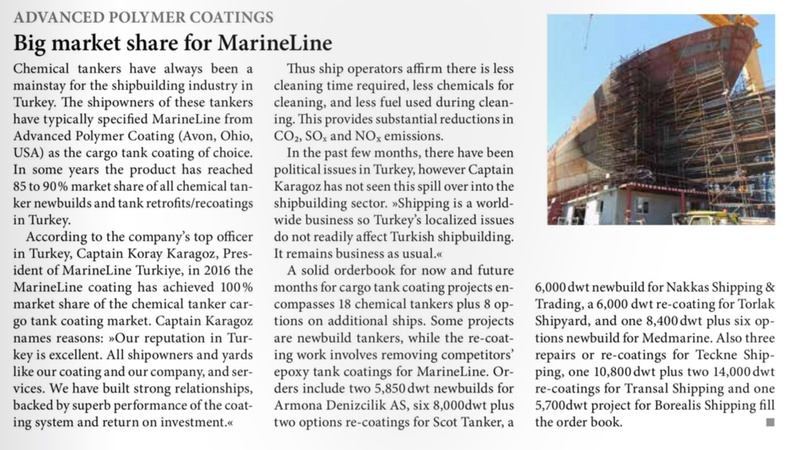 Tanker Shipping: As seen in: Hazardous Cargo Bulletin "News Alert"
View the story of MarineLine® 784, the world's leading high performance coating/lining used for cargo tanks on chemical and product tankers. MarineLine® 784 handles the widest range of liquid cargoes of any coating/lining on the market, and is used on hundreds of ships throughout the world.